We all want to be healthy, but sometimes life gets in the way. You may not have time to swing by the local farmer’s market and buy organic, locally-grown fruits and veggies to throw into a juicer each morning. This is especially true if you have to get the kids ready for school and then survive another 10-hour work day followed by dropping the kids off to practice and maybe making a quick trip to the gym if you are lucky. And then there’s all the confusing, conflicting nutritional information in the media. One moment resveratrol is the darling of the anti-aging world. The next day you read an article that says it does bumpkus but tells you to absolutely add Vitamin D supplements to your diet. What are you supposed to do? How do you keep yourself and your family healthy? The answer is simple. Find a comprehensive supplement filled with the vitamins, minerals, and nutrients that have been shown to protect and improve overall health and wellness. That’s exactly what we’ve done with Perfect Plus, a supplement that is so complete we call it a superfood. 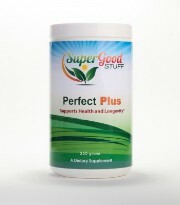 Perfect Plus includes a balanced blend of minerals, essential fatty acids, proteins, essential amino acids, and over 105 antioxidants to help increase your energy, boost your immune system, and fight the free radicals that cause aging.